WEST LAFAYETTE, Ind.  Lasers are finding gold at Purdue University. Researchers have taken a step toward developing a new type of ultra-sensitive medical imaging technique that works by shining a laser through the skin to detect tiny gold nanorods injected into the bloodstream. Findings are detailed in a research paper that appeared online last week in Proceedings of the National Academy of Sciences. The paper was written by researchers in Purdue's Weldon School of Biomedical Engineering and the Department of Chemistry. The nanorods might be used to develop an advanced medical imaging tool for the early detection of cancer, said Ji-Xin Cheng (pronounced Gee-Shin), an assistant professor of biomedical engineering. The gold rods are about 20 nanometers wide and 60 nanometers long, or roughly 200 times smaller than a red blood cell. Gold nanorods represent a possible way to overcome barriers in developing advanced medical imaging techniques that use light to analyze blood vessels and underlying tissues. "One obstacle is that light in the visible spectrum does not pass through tissue very well," said Alexander Wei, an associate professor of chemistry who worked with Cheng and other Purdue researchers, including Philip S. Low, a professor of chemistry. Imaging methods might be developed using laser pulses in longer wavelengths of light, beyond the visible range in a region of the spectrum called near infrared. "There is a window of light in the near infrared, wavelengths from about 800 to 1,300 nanometers, which could be harnessed for new imaging technologies," Wei said. Tiny gold rods with a certain "aspect ratio" of length to width shine brightly when illuminated by light in this spectral region. The gold nanorods are ideal for a type of imaging called "two-photon fluorescence," which provides higher contrast and brighter images than conventional fluorescent imaging methods. Photons are the individual particles that make up light. In two-photon fluorescence, two photons hit the nanorod at the same time. Because of the two-photon effect, the method might enable scientists to develop advanced "non-linear optical techniques" that provide better contrast than conventional technologies. Cheng is applying the two-photon fluorescence and other non-linear optical effects to develop imaging methods that provide improved contrast over conventional technologies. The researchers injected the nanorods into mice and then took images of the tiny structures as the nanorods flowed through blood vessels in the animals' ears. Individual nanorods proved to be 58 times brighter than the two-photon fluorescence from a single rhodamine molecule. Within a half hour after being injected, the nanorods could no longer be observed in the animals' blood, presumably because the rods had been filtered out of the blood by the kidneys. "To be able to detect cells at an early stage of disease such as cancer, it is important to have a reliable technique that has sensitivity at the single-particle level," Wei said. "The gold nanorods demonstrate that Cheng's nonlinear imaging methods are capable of this level of detection." The research has been funded by the National Institutes of Health and the Purdue Cancer Center and is affiliated with the Birck Nanotechnology Center and the Bindley Bioscience Center, both in Purdue's Discovery Park, the university's hub for interdisciplinary research. The research paper was written by Haifeng Wang, a postdoctoral research associate in biomedical engineering; Terry B. Huff, a graduate teaching assistant in chemistry; Daniel A. Zweifel, a graduate student in chemistry; Wei He, a graduate research assistant in chemistry; Low; Wei; and Cheng. Note to Journalists: An electronic copy of the research paper is available from Emil Venere, (765) 494-4709,venere@purdue.edu. Gold nanorods excited at 830 nm on a far-field laser-scanning microscope produced strong two-photon luminescence (TPL) intensities, with cos 4 dependence on the incident polarization. The TPL excitation spectrum can be superimposed onto the longitudinal plasmon band, indicating a plasmon-enhanced two-photon absorption cross section. The TPL signal from a single nanorod is 58 times that of the two-photon fluorescence signal from a single rhodamine molecule. 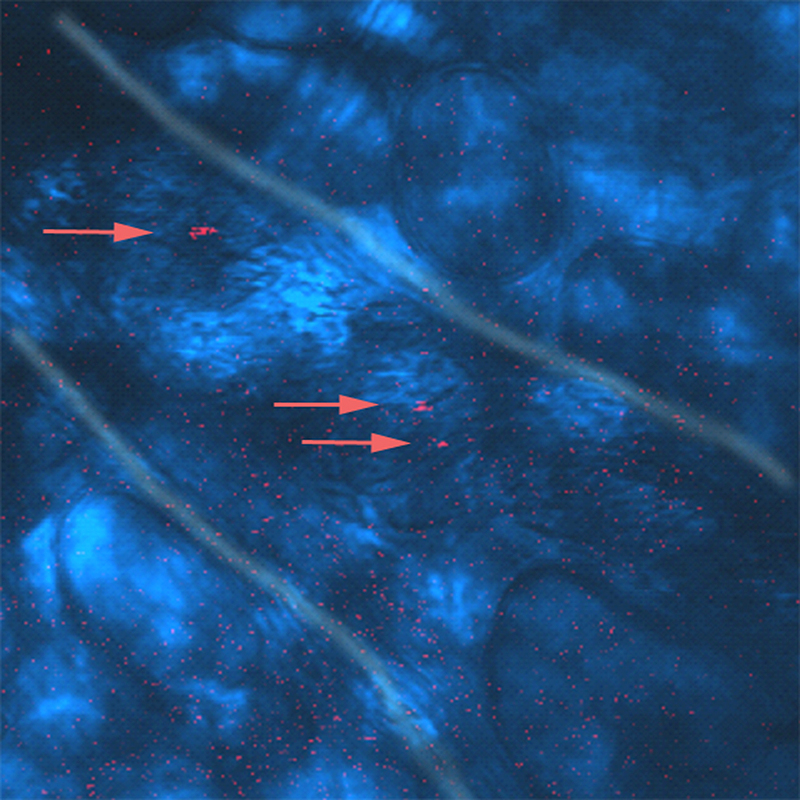 The application of gold nanorods as TPL imaging agents is demonstrated by in vivo imaging of single nanorods flowing in mouse ear blood vessels.